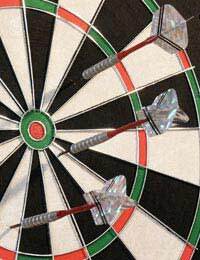 Darts is a popular sport in many countries, especially in the UK, Holland, Scandinavia and the USA. It can be played by almost all age groups and dartboards can still be found in many pubs in Britain. You can play darts as a recreational sport and even set up a dartboard to play at home, and the equipment is relatively cheap compared to other sports. There is a professional darts circuit with prize money in the tens of thousands of pounds range for the top professionals. For many years the image of a professional darts player was one of an overweight man who downed as many pints during a game as they threw darts. In the last few years the sport has worked hard to get rid of this image and while some pro darts players still look more like Robbie Coltrane than Robbie Williams in stature, the heavy drinking that was once synonymous with the sport has all but disappeared. So darts must be a safe sport then, nobody can get injured just playing darts surely? Well surprisingly there are a number of injuries suffered every year that involve darts and dart players. So here are some tips on how you can play the game safely without causing injury to yourself or anyone else. It's a good idea to buy youngsters a set of soft tipped darts and board. The board is made of plastic and has small holes cast into it. The soft tip darts stick to the board in the small holes. This type of dart is a lot safer than metal tipped ones and are less likely to cause an injury if they strike anyone. . If you follow these guidelines then you will be playing safe and hopefully have loadsof fun.